Jaisalmer, the golden city of India, is one of the finest travel destinations to be visited to explore the best of the Indian heritage. As the city was under the influence of Rajputs, there are various forts, palaces and temples dotted throughout the city. These structures have contributed to the rich heritage of the nation and are also acclaimed as major landmarks of the city. Situated in the threshold of Thar, the city was founded by Bhatti Rajput Rao Jaisal in 1156 AD. 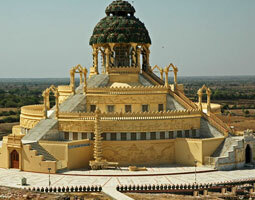 In terms of the excursion, the city houses the popular Jaisalmer Fort. In addition to this, visitors can enjoy Camel Safari in the Sam Sand Dunes for a memorable vacation. The city is also dotted with various major attractions, worth a visit, such as Laxminath Temple, Jain Temples, Akal Wood Fossil Park, Patwon ki Haveli, Nathmalji ki Haveli, Salim Singh ki Haveli, Jaisalmer Folklore Museum, Desert Culture Centre & Museum, Government Museum, Mool Sagar, Gadi Sagar, Amar Sagar, and more.